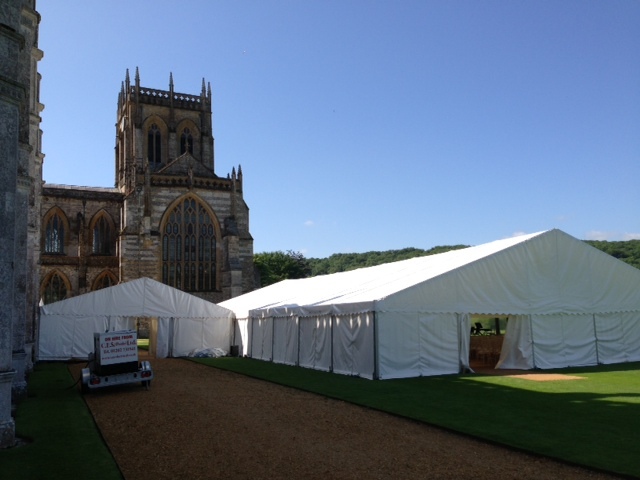 Here is a selection of marquee work we have undertaken over the past few years from various types of event. We hope you'll find it a useful resource of information, pictures and contacts. 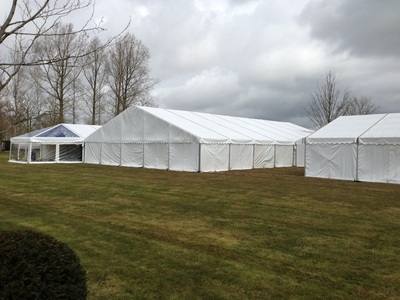 For our latest work please see our Latest marquee projects where there's a wealth of helpful material too. ​As one of the largest jobs we’ve undertaken, we were delighted to be involved in this large wedding for Georgina and Edward and it’s one we’ll look back on with fond memories for a very long time. The brief was to create a large drinks reception space with excellent views for 350 guests but with separate dining and dancing areas for 250 to be kept hidden until the evening. Clear roofs over the dining space were requested plus an array of outside lighting to bring as much of the outside in as possible. 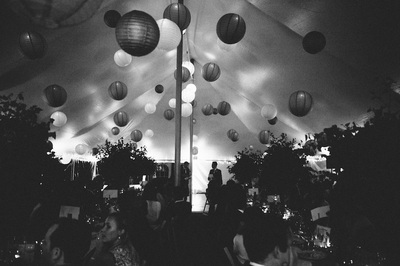 The wedding breakfast was an evening affair so lighting was very important too. We proposed two 15m wide clearspan (frame) structures in an L-shape with 3m high legs as opposed to the usual 2.3m in order to maximise views over the jaw-dropping parkland and lake. 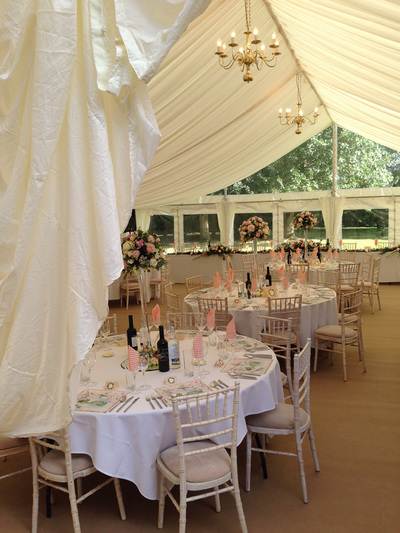 The reception marquee had a covered wooden deck veranda area plus dancing marquee and toilet/cloakroom attached. 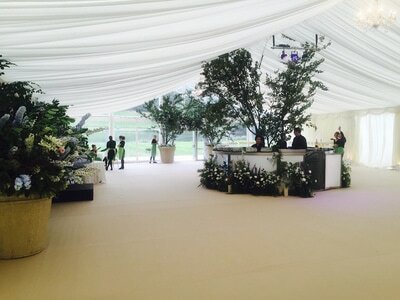 The marquee was joined to the house by a 3m wide walkway carefully weaved around topiary hedges and flower urns. As access to the back of the house was fairly limited and we had almost 30 tons of equipment to install, we used an all-terrain forklift with grass friendly ‘flotation’ tyres to unload and position the bulk of the equipment. Ground protection mats aided the task further. Installation commenced on the Monday before the wedding but Oakleaf were on site each day through to the early hours of Sunday morning to ensure everything went smoothly. Throughout the installation we were joined regularly by the resident dogs who reminded us that you must always keep an eye on your lunch bag (we'd never seen a dog eat a whole block of cheddar before). 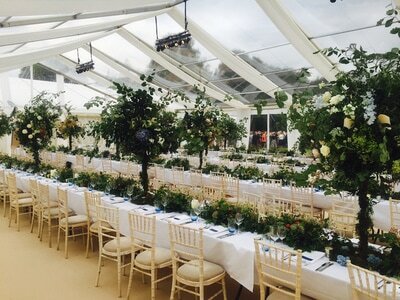 The dining marquee with flowers by the renowned Miranda Fairhurst was an absolute triumph. 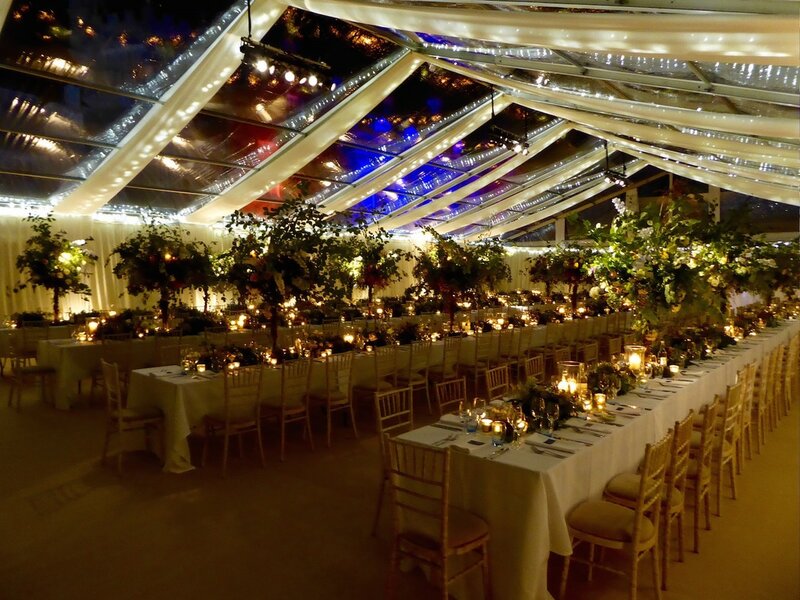 The clear roofs, ivory drapes, fairy lights, spotlights, uplights, champagne carpet and candles created a magical and warm evening ambience that many guests commented on. In the reception marquee, Miranda created pot plants the like of which we've never seen before and the foliage around the bar and tree in the middle was incredible. Her team were a pleasure to work with from start to finish and we enjoyed a stack of pizzas together on the Friday evening. In the grounds we installed LED multipar and HQI floodlights to bring the trees alive at night and illuminate the house. Sadly we couldn’t release floating candle lanterns on the lake because of the blustery conditions but we were able to position candles in paper bags along the water’s edge. The reception marquee was fitted with white sofas and cube stools while the guests were having dinner and the dancing marquee revealed for party time. As always with marquees, what took the best part of a week to create was packed down and removed in just a couple of days leaving nothing behind but slightly discoloured grass, a couple of satisfied dogs and some brilliant memories. Are long tables better than round tables? It's personal preference really although we find long tables more sociable and slightly less formal. ​Can candles be used inside the marquee? Yes, everything is fire retardant but someone needs to keep an eye out. LED candles are a good option too. ​Are clear roofs expensive? 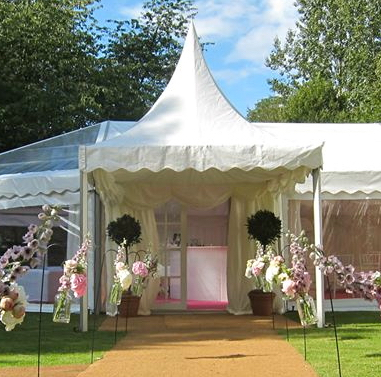 Around double the price of a conventional ivory pleated lining but the whole marquee doesn't need to be clear, you could have a clear roof over the reception, bar or dance floor areas only for impact. 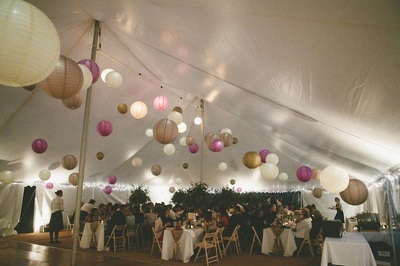 Kimberley and James had a very clear vision of how they wanted the marquee to appear. Set in the groom's parents' astonishing garden, the main priority was to bring the outside views in and ensure the marquee decoration didn't compete too much with the beautiful garden. The groom works in the music business so lighting both inside and outside the marquee was very important too. The first stage of the build was to lay 12m x 36m of wooden flooring (we remember it well because the rugby world cup had just started and there was plenty of chat about England's chances while we worked - how foolish we were!). 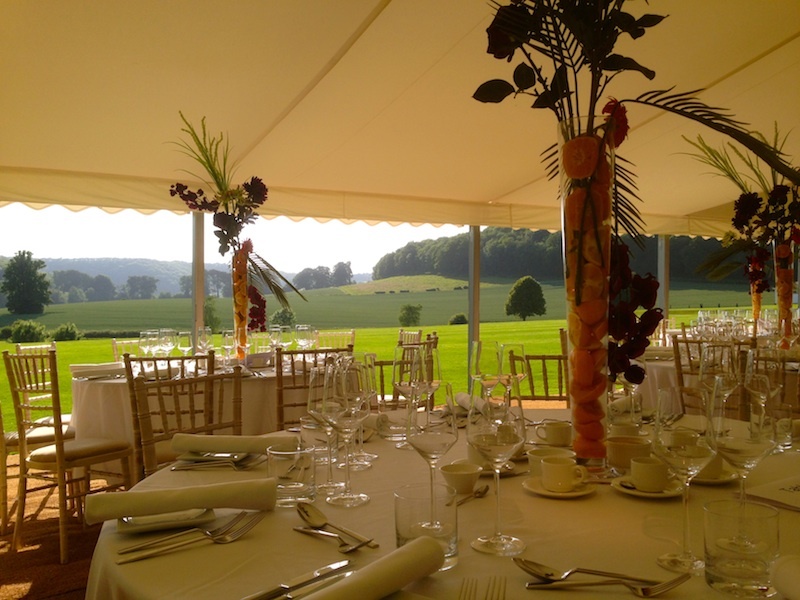 We then erected a 12m x 30m traditional pole marquee with panoramic windows most of the way around and two 6m x 6m oriental canopies on the front as a porch/veranda. A walkway connected the main marquee to a dedicated toilet/cloakroom marquee. A short distance away from the marquee we installed a baby tipi with Moroccan comfy furniture and open fire for chilling out. 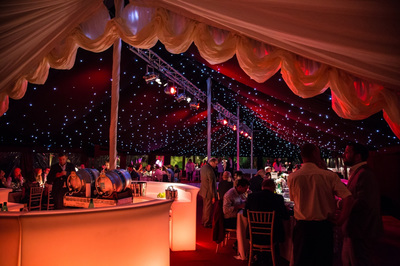 The interior featured a new 'rubin' red carpet, black starlight, LED cans and spotlights on trussing suspended between the poles, white dance floor built around a pole, ivory reveal curtain, illuminated curved bar, sofas, armchairs, long tables and limewash chairs. In the porch/veranda space we positioned two flame gas heaters to keep people warm in the late-September evening chill. As well as throwing out plenty of heat, the heaters are a nice effect in their own right with real flames leaping 2-3ft high in glass tubes. As the marquee windows were very important, each was framed by black drapes which gave them the appearance of a framed picture. In the garden we installed over twenty lights including HQI floods for the larger trees plus multipar LED lights and spike lights for smaller trees, bushes and house. It's amazing the magical effect that can be created with just a few well-placed external lights. If your marquee has lots of windows, it's nice to look out at something once darkness descends instead of a black void. 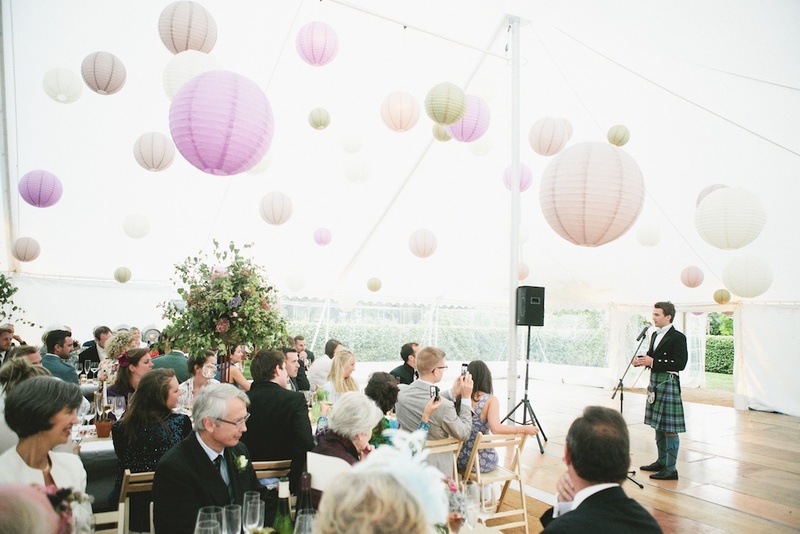 In line with the groom's profession, flight cases adorned with stickers from various international tours and concerts were dotted around the marquee as occasional tables. Each guest was given a personalised backstage pass with the itinerary for the day which was a very nice touch. A juke box kept everyone entertained in the evening whilst other guests chose the warm and quieter embrace of the tipi fire! Feedback from the very happy couple: "The dust is just settling from what was an amazing few weeks of our lives, not least due to the fantastic job Oakleaf did on the marquee. Thank you so much for the design, setup and execution of it all. Your staff where incredibly polite and helpful, Ed in particular was a star." How do you create the twinkling night-sky effect? With a black starlight ceiling (heavy black fabric with thousands of brilliant white LEDs). How many people can you get in the small tipi? 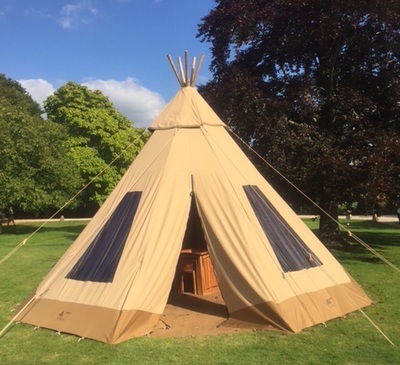 It's our 6.5m Baby Tipi which takes around 15 standing, 10 sleeping or 12 seated. Is exterior lighting expensive? 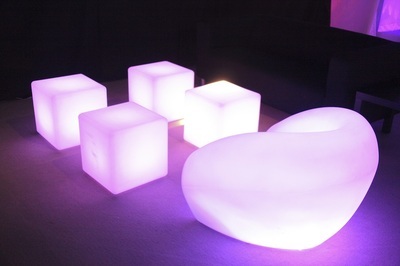 For the effect you get it's very cheap - £150 would bring the average garden to life at night. 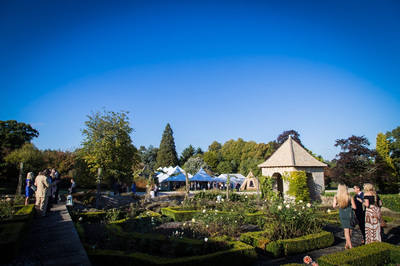 It's not often you get to do a marquee and bar for a hundred Geordies in a beautiful private garden in Wiltshire, so we were thrilled to get the contract. The customers were on the verge of booking with another firm they weren't completely comfortable with, so they asked us to quote at the last minute. A site visit was organised immediately and they booked within a week with the groom commenting "you filled us full of confidence that you are the perfect partner to provide everything for our wedding". The garden views were outstanding with mature trees on all sides. With this in mind, we recommended our new cruciform structure with clear roof sections (meaning a 12m clearspan can be joined to a 9m clearspan in a T-shape), plus panoramic windows and clear gable. It was the first time we'd installed the cruciform so we didn't finish until almost 1am, but that's how the events business treats you sometimes. Thankfully we were within range of the nearest Dominos Pizza and it wasn't raining so morale remained high. 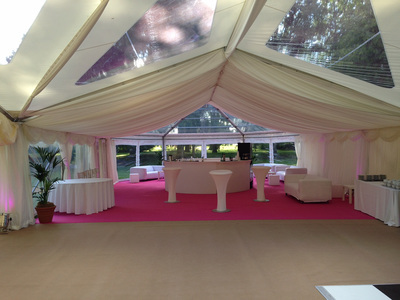 Inside the marquee the customers wanted two distinct areas: one for tables and dance floor and another for bar, lounge and entrance but without dividing the party too much. We recommended a different colour carpet in the bar area to give it a different feel which proved very effective. 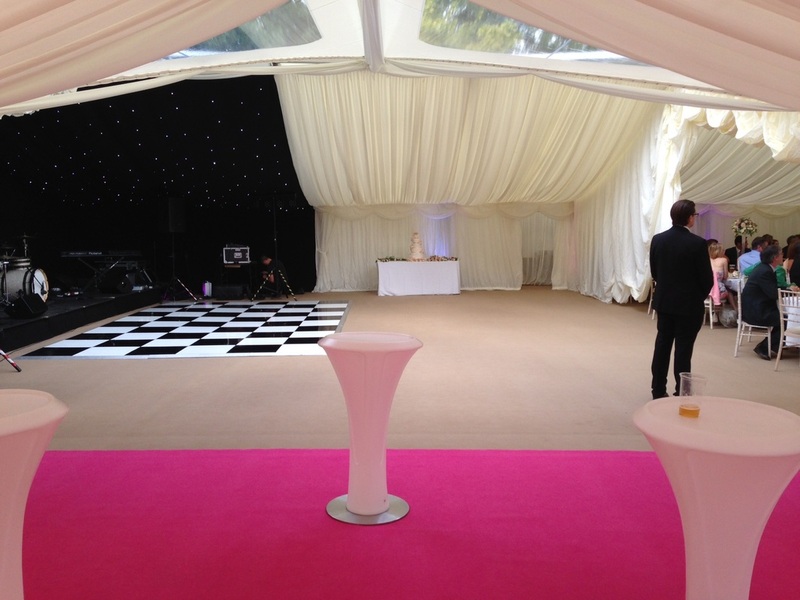 The tables/dance floor area had a coffee carpet and the bar/lounge a pink carpet. 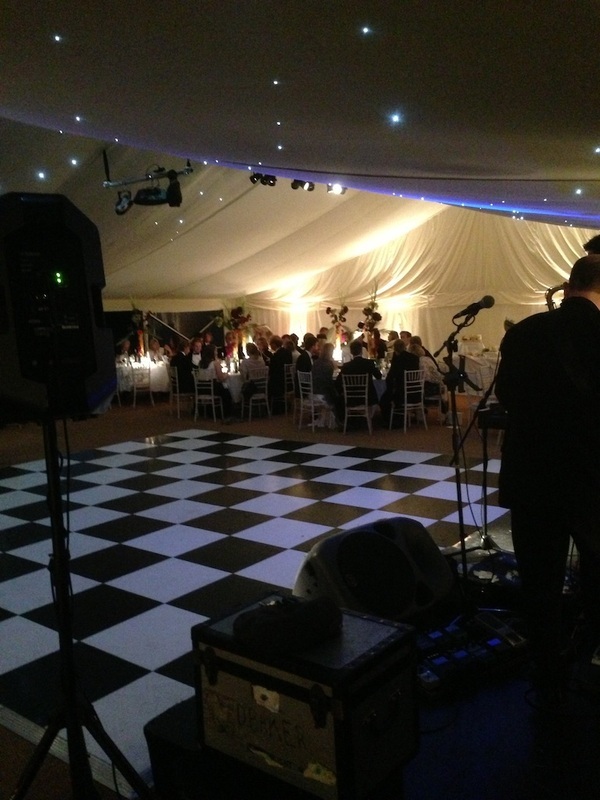 An 8ft x 36ft stage was installed at one end of the marquee for the band with black and white dance floor and black starlight ceiling above. 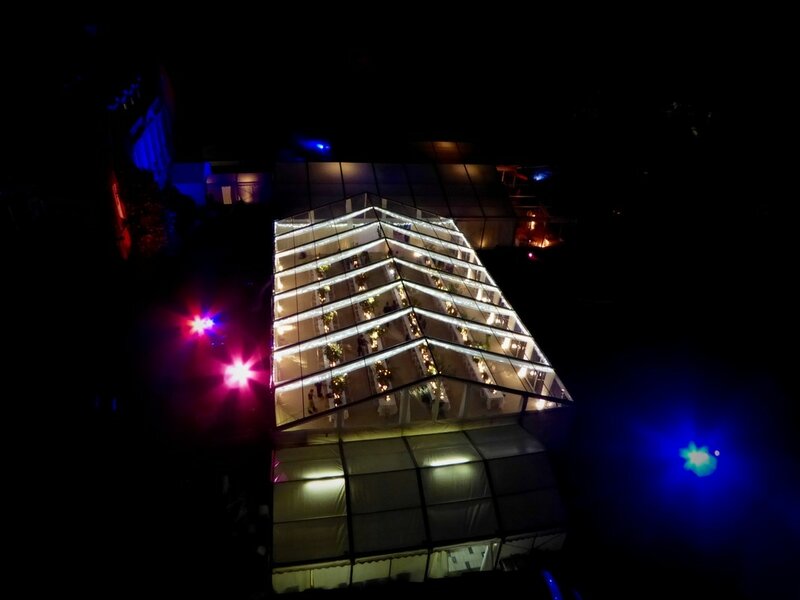 The transition between black starlight and the illuminated tree canopies through the clear roof sections was a stand-out feature. The groom joked that he'd like a black and white striped dance floor instead of the usual chequered as a tribute to Newcastle United, but he was swiftly overruled! The furniture included circular illuminated bar, illuminated cube stools and poseur tables, limewash chiavari banquet chairs with ivory pads and white sofas. The table centres (not supplied by us) were particularly striking - tall glass vases with flowers always catch the eye. For the lighting we supplied elegant brass chandeliers in combination with white uplights and coloured LED uplights. The tall pot plants and bay trees were supplied by our friends at Superplants and they gave the space a homely, natural feel. 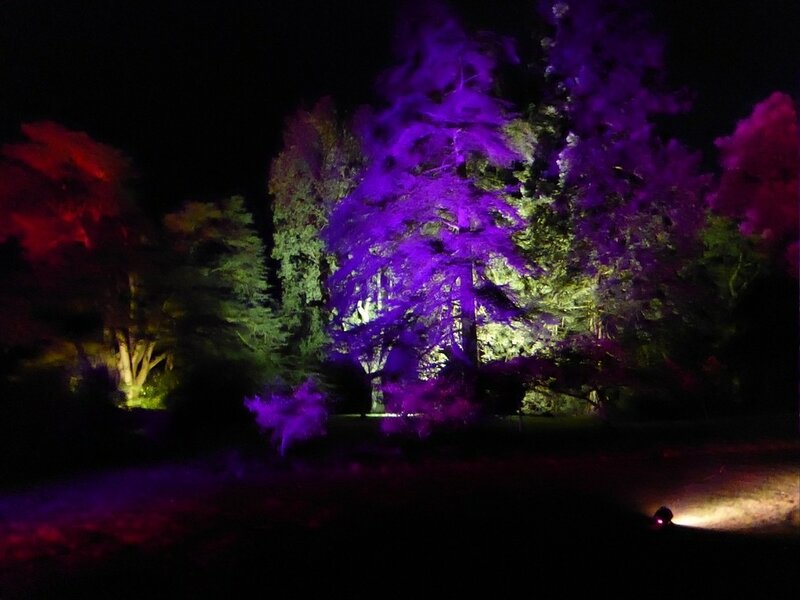 Finally, the beautiful trees were illuminated with a mixture of HQI floodlights, colour-changing floods and spike lights. ​What is the clear end on the marquee? It's a combination of panoramic windows and a clear gable. What is the pointy roof marquee? It's an oriental canopy. 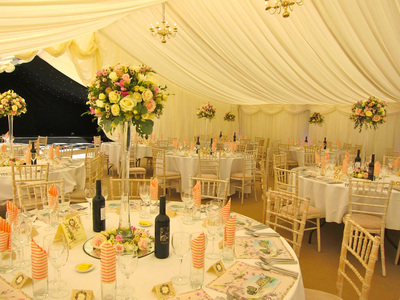 What is the dividing curtain in the middle of the marquee? It's called a reveal curtain which can be easily raised and lowered. ​Which Dominos pizza was the most popular? Texas BBQ without question. Philly and Andrew's journey with Oakleaf started as most do, with a site visit. The interrogators in chief were the parents of the bride who plied me with more tea and biscuits than a man should be able to cope with. Funnily enough, they used a marquee for their wedding too so the whole thing was a bit of a trip down memory lane. There were two potential locations: their lovely back garden or a nearby field. The preference was for the garden because it would give the day a nice 'at home' feel. I measured out the proposed size of 12m x 18m and was asked one of the questions I get asked most regularly: 'can we REALLY get 120 people, catering tent, entrance tent and large dance floor in this space?' to which I gave a resounding 'yes'. It's hard to visualise space with a few markers on the ground but once you get a roof up or compare the available space to an average village hall you soon get a better sense of it (and we are always happy to provide 3D layout plans to help further). I passed the initial test and met the bride and groom a week later (accompanied by more tea and biscuits) and the whole thing started to evolve quickly from then on. 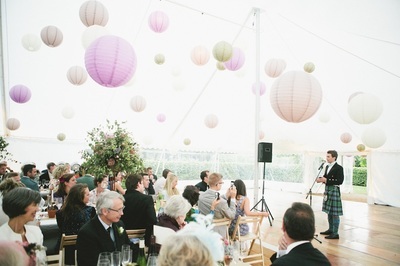 The brief was to create a traditional country wedding marquee with plenty of dance floor space for a ceilidh (groom is a genuine Scot), guests seated at long tables, wooden folding chairs, lots of paper lanterns (80 in total, all lit) and a hundred-ish feet of fairy lights thrown in for good measure. 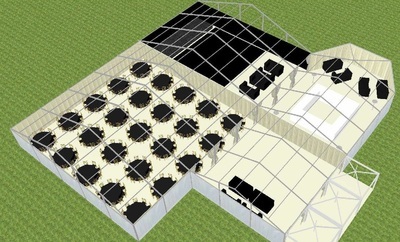 A layout plan was created which was greatly appreciated as there were concerns over the available dancing space and the distance between chair backs. The weeks passed quickly and before we knew it, September arrived and the Oakleaf team commenced installation on the Tuesday before the wedding. Ed was the site manager assisted by George, Ben, Stuart, Kerry, Adam and, when it was time for 'lantern mayhem', by Matt too. I was there at the start to enjoy the pre-wedding buzz (and more tea and biscuits) and popped in on a couple more occasions leading up to the big day whenever the homemade lemonade was on offer. Andrew the groom kindly put together the following video montage which includes time-lapse footage of the installation. 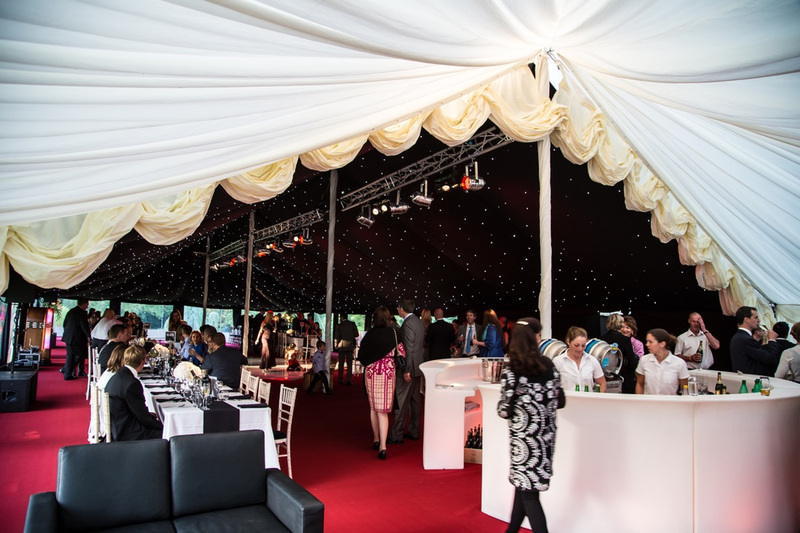 In addition to the main marquee (traditional 12m x 18m), we also provided two 3m x 3m oriental canopies to be used as entrance tents, a 6m x 6m oriental canopy catering tent and a 45kva silenced generator to power everything. The flooring is coconut matting, the dance floor is varnished wooden boards and the chairs are natural wooden folding chairs. 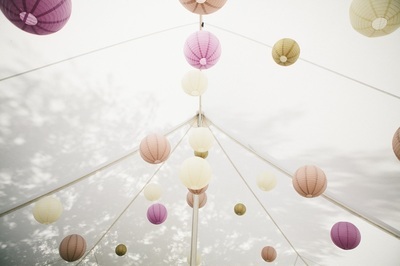 The lanterns are 12, 16 and 20 inches in diameter and a mix of ivory, violet, gold, latte and purple. Here is a selection of photos of the finished product which we think was really beautiful. Click on the images to enlarge them. Thank you to Philly, Andrew, Margaret and Jeremy for being such a pleasure to work with from start to finish. Any chance of having that lemonade recipe? Little pots of honey supplied by the father of the bride's bees - a lovely touch. How did we make the lanterns appear as though they're floating? With fishing line. How did we illuminate the lanterns? The highest lanterns were mains powered but the bulk were battery-powered LEDs. What kind of windows are they? They are called 'panoramic windows'. What other lighting is there? 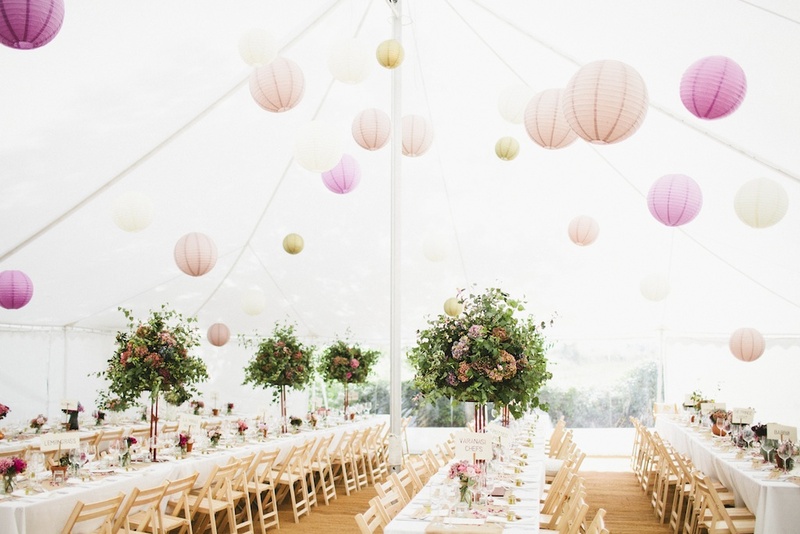 Uplights and fairy lights around the perimeter. We always jump at the chance to do functions for 250 guests, particularly when they're right on our doorstep! 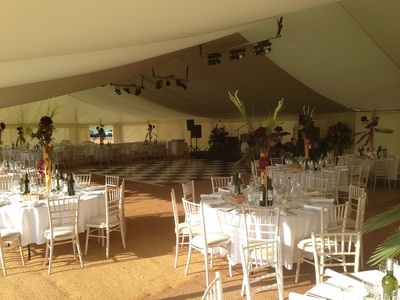 The customers had hired marquees several times before and had a very clear vision of how they wanted it to look. 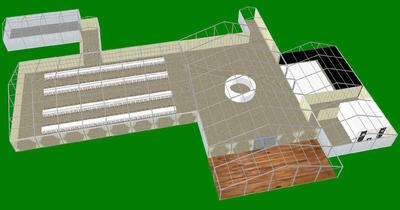 It was a big project for us and I was determined not to let it slip through the net. The brief was to create a classy venue suitable for a 21st party with two distinct areas: a dining and reception area plus a 'hidden' nightclub style bar and chill-out area (hidden behind a black reveal curtain spanning the width). The marquees were to have a black starlight ceiling throughout, spotlights shining onto each table, LED uplights around the perimeter; black sofas, illuminated bar and cube stools in the chill-out area and a solid wooden floor with new cream carpet throughout. 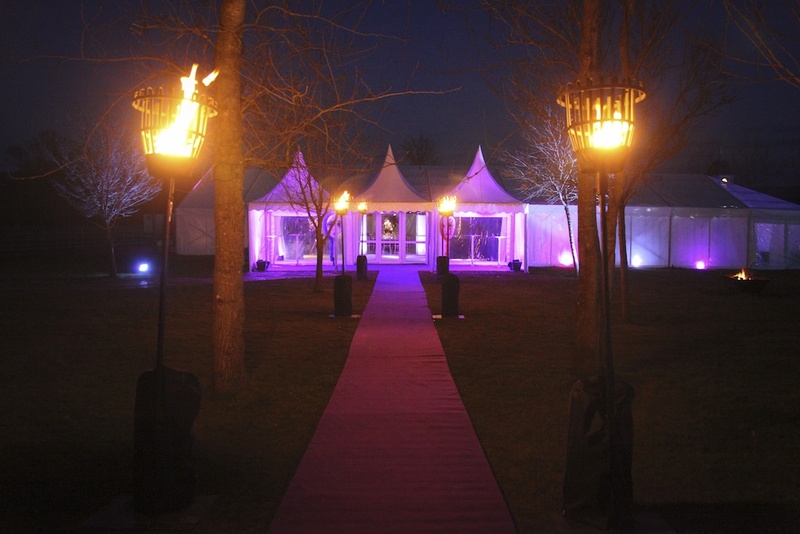 As you may recall, April 2013 was particularly cold with icy winds present throughout the month, but this was no problem thanks to our state-of-the-art thermostat controlled heaters and glazed doors which kept the entire 8,000 square foot venue cosy. We were on site for the whole week leading up to the party. 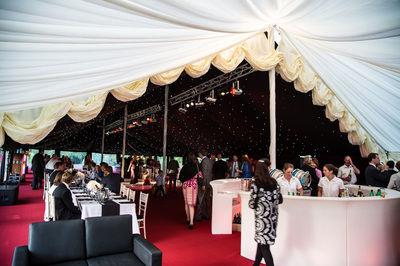 The main structures were installed on Monday by the entire Oakleaf team (15m x 24m dining/dancing marquee, 9m x 21m reception/bar/chill-out marquee with clear roof hex end, 9m x 9m catering marquee, 9m x 6m loo marquee and 3m x 9m walkway - all clearspan structures, plus three 3m x 3m oriental canopies in a row for an entrance/covered smoking area). The wooden floor, carpet and linings were installed on Tuesday followed by the electrics, furniture and 'topping and tailing' on Wednesday and Thursday. It rained solidly all week which made conditions underfoot particularly tiresome - there was mud everywhere (great fun when it came to reversing the loo trailer into position). We used ground protection boards to minimise ground damage and prevent muddying the interior. Party night arrived and believe it or not the rain subsided as guests started arriving. 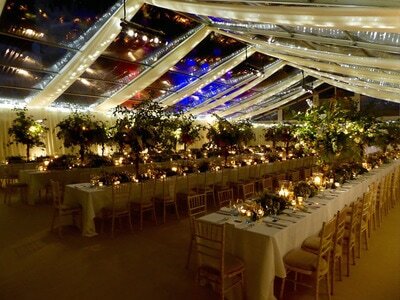 Following an incredible firework display, the guests entered the marquee for dinner. Several were excitedly taking photos of it as they took their places (which I take to be a very good sign of approval). Following dinner, the fathers and best friends gave entertaining speeches followed by the birthday girl and boy. 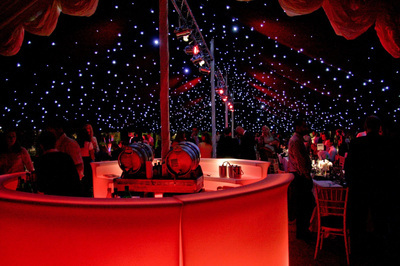 When the final line 'enjoy the party and don't hold back' was delivered, the black reveal curtains dropped to the floor instantly accompanied by amazed gasps to reveal the trendy bar, chill-out and nightclub area that they wanted right from the start - and the DJ dropped the first track with a flash of strobe right on cue too. At the bar were two mannequins dressed up as the birthday boy and girl! Wow - what a party! I left with a colleague at 2.30am and from what I've heard it petered out around 6am. I was the first one back in the marquee later that morning and was somewhat taken aback when I noticed a body face-down on the dance floor. Thankfully, just as I was contemplating ringing for an ambulance I realised it was one of the mannequins! Here is a selection of photos showing the interior, a photo of the exterior taken on my iPhone plus the layout plan of the two main marquees and entrance. Thanks to Sarah and Julia for your faith in us and your support and clear vision throughout. What sort of dance floor is that? A glossy black dance floor. What lighting is giving the purple effect at the entrance? LED washes and uplights. What part of the marquee has the clear roofs? It's called a 'hex' or 'bell' end - great for bars and chill-out areas. 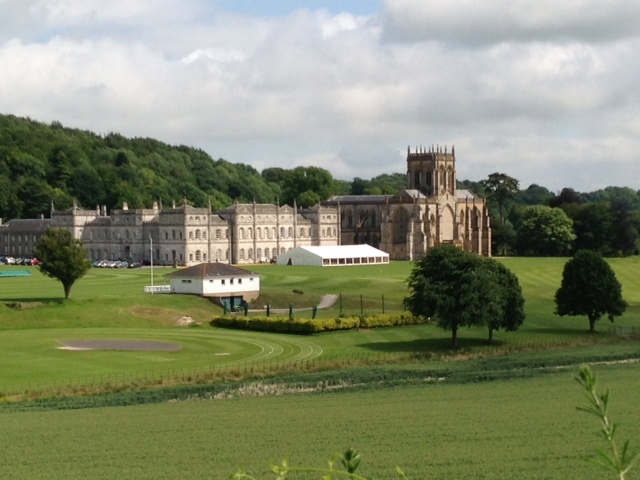 We were thrilled at the opportunity to quote for this annual event at one of Dorset's leading independent schools. At the site visit it was made clear that they didn't want to experience the same issues that had hampered the previous year's event ever again. It had rained the year before both heavily and persistently to the extent that the power cut out several times during the ball, the marquee (not one of ours) started to flood around the walls and the walkway between the building and marquee was flooded by two inches of water. I assured them that none of these issues would reoccur, regardless of the weather, and that I would be present on the day to ensure everything went smoothly. They liked our quote and we got the job. We arrived to commence the build on the Wednesday before the Friday events. 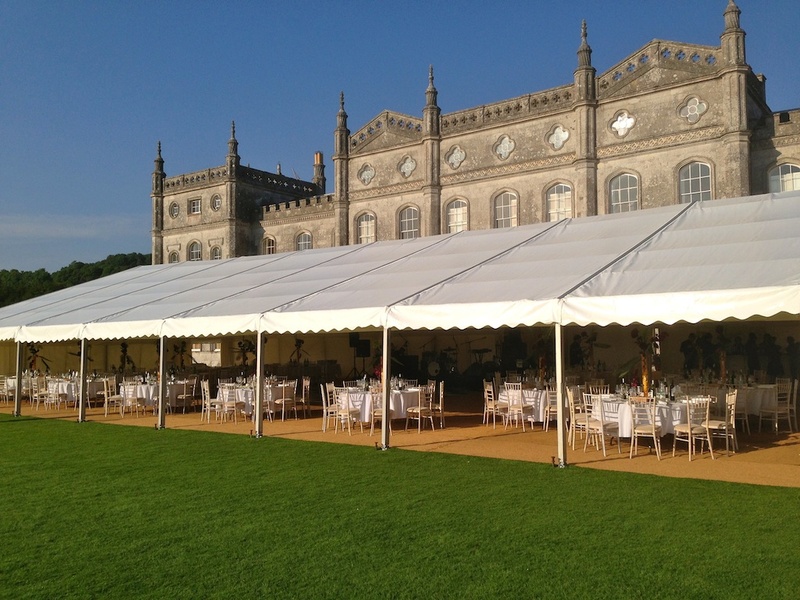 Not only did we have a 15m x 30m clearspan marquee to build but also five 9m x 9m canopies (one for each house to host drinks on one of the cricket pitches), a 3m x 9m walkway link to the school building and a 3m x 3m canopy. 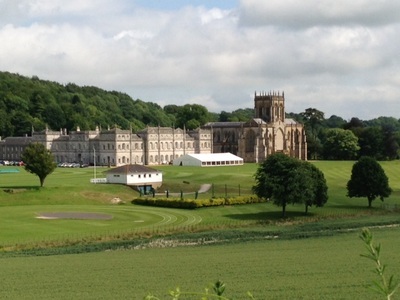 The main marquee was to be used for two events: first up, speeches for 700 seated followed by a ball for 150 guests six hours later. Thankfully, the weather forecast was looking good so we didn't need to supply the wooden floor we had in reserve in case of wet weather (wooden floors are useful because they raise the floor up a couple of inches and allow water to pass underneath). The electrics were professionally installed using weatherproof equipment and, as the electric cut-outs the year before had caused so much disruption, we provided a back-up generator just in case. The walkway between the building and marquee was over a cambered path where water could easily pool at the sides, so we constructed a bespoke wooden ramp several inches off the ground in order for catering staff to pass between the building and marquee without having to swim. 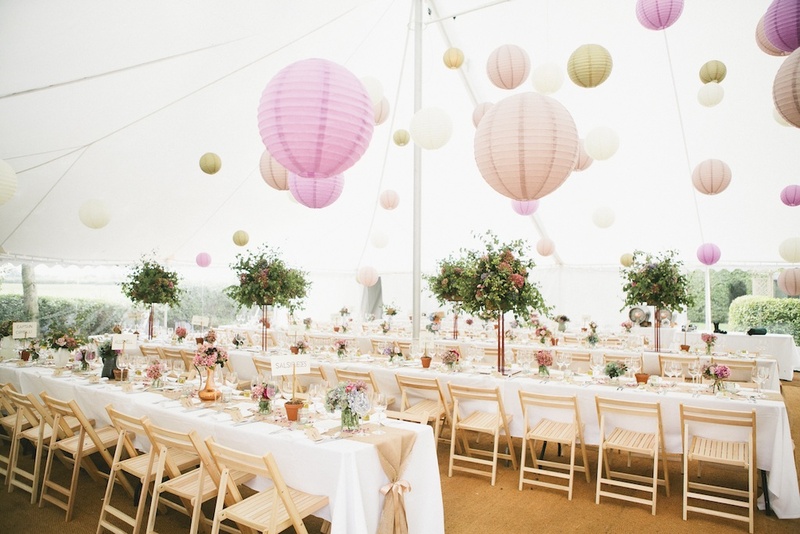 Not being a fan of the rickety plastic folding style chairs (or any plastic chairs for that matter), we supplied 700 wooden banquet chairs with pads for the speeches along with a PA system and large stage. After the speeches and prizegiving, it was all change as the large marquee needed to be transformed into an attractive venue for an evening ball. 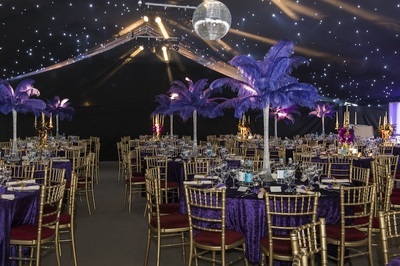 With the clock ticking, 550 chairs were removed, a large black and white dance floor was laid with disco lights installed above, round tables were rolled into position, our illuminated semi-circular bar was put in place and the catering staff commenced laying up and decorating tables. 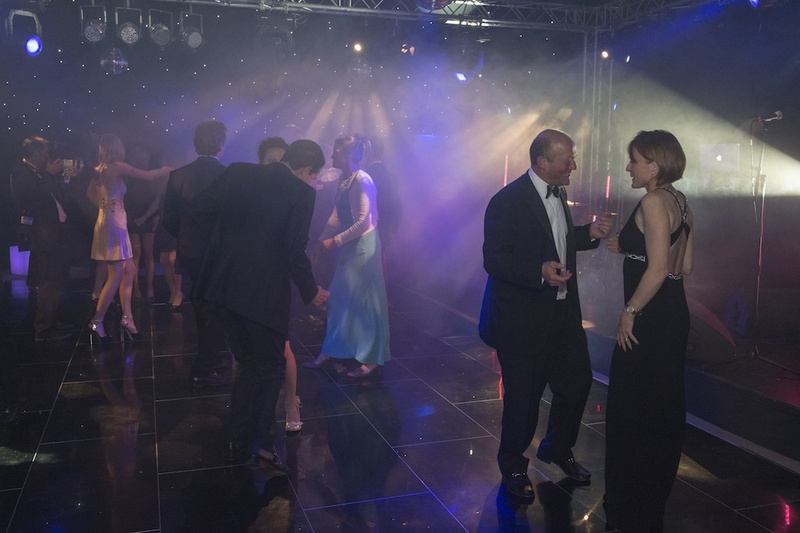 The leavers' ball marks the end of the school year and an emotional farewell for many sixth form pupils. It was crucial that they received the classy event they deserved and a send-off to remember - and that's exactly what they got. On a glorious summer's evening, wonderful food and drinks were prepared and served by the school's in-house catering team accompanied by music from outstanding local band The Jackson 3 who picked up the tempo after dinner and kept the dance floor full all night. A great day to remember. 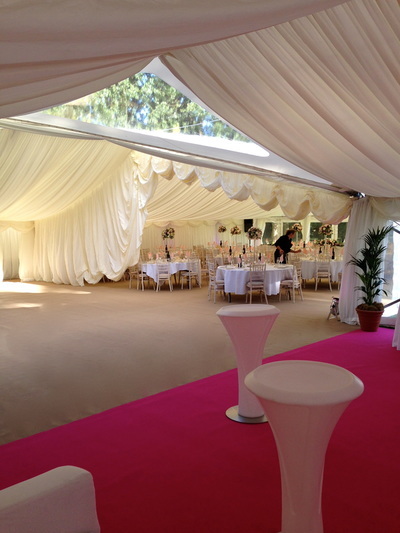 Here is a selection of photos of the marquee as it looked for the leavers' ball (taken on an iPhone so please forgive the quality). What sort of lining is that? It's a flat ivory lining with a section of ivory starlight ceiling. Are the windows and walls easy to remove? Yes, very, they take about a minute per section. For more ideas and inspiration view our complete picture gallery here.